I wanted to write a quick post before bed and thought this was the perfect quick project to share! 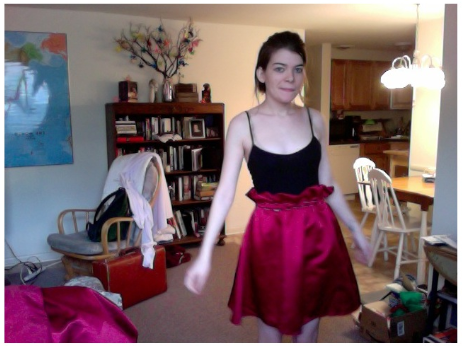 This is a sweet satin skirt I made from an old bridesmaid’s dress that belonged to my boss. I’ve really been digging high-waisted skirts recently (they’re so chic!) and thought I’d make my own. My favorite part is, obviously, the fantastic ruffled hem! This was pretty easy to make, I just measured how long I wanted the skirt to be on my leg, then added four inches for hemming and cut that much up from the bottom of the dress. 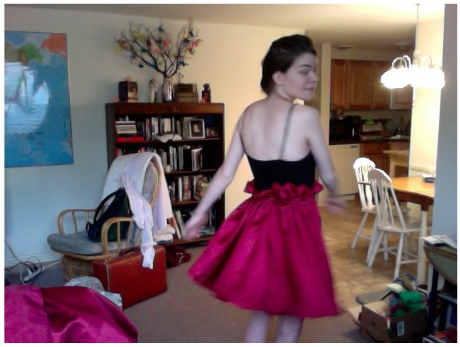 (Because it was the bottom of the dress, it was already hemmed!) I hemmed the top four inches, then sewed all the way around, two inches above that hem. I slid a strip of elastic (that I had to measured to be snug around my waist) in between the two seams and then sewed its two ends together. Instant skirt! Because it’s a thick material, the ruffles are very full and stand up nicely. This skirt makes me ready for Christmas! Also, in fabulous news, I’ve finally figured out the perfect setting on my sewing machine to make my stitches just perfect for most (read: non-stretchy) fabrics! And it only took me two years! =P That’s all for now; I’m sleepy and it’s time for bed! Thanks for reading!